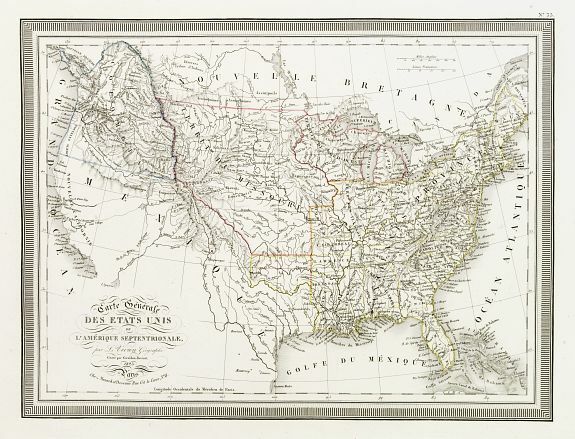 MENARD & DESENNE - Carte Générale des Etats Unis de L''Amérique Septentrionale..
Map maker : MENARD & DESENNE. Size : 12.2 x 16.1 inches. / 30.9 x 40.9 cm. Description :Detailed map of United States. Prepared by L.Vivien and engraved in steel by Giraldon-Bovinet. Published by Menard and Desenne, rue Git-le-Ceur 8, Paris. Condition : Wide margins. With very light, marginal water staining along the left border. Else very good condition.